The Autobag Kit-Veyor infeed conveyor is a high productivity system designed to automatically collate small parts into packaged kits. 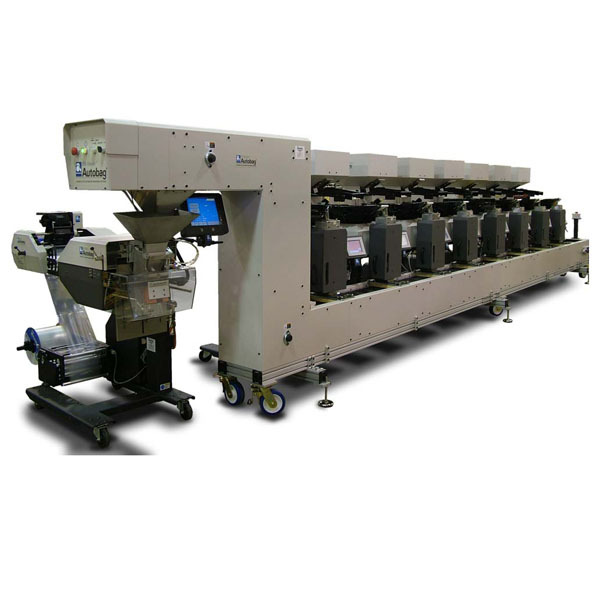 The Kit-Veyor system integrates multiple Accu-Count® vibrating counters with an Autobag bagger to create an auto load kit packaging system capable of bagging mixed parts kits at speeds up to 60 bags per minute. Each counter is set-up using an operator-friendly AutoTouch™ Control Screen, and automatically dispenses a pre-determined quantity of parts into the conveyor buckets as they pass by. Once all of the parts have been collated, the kitted product is automatically loaded and sealed in an Autobag pre-opened poly bag, while another bag is presented for loading. The Kit-Veyor operates in continuous or intermittent modes, and is fully customizable to meet a variety of packaging infeed requirements. New Autobag DeviceNet technology enables next-generation Kit-Veyor systems to communicate efficiently with all system components, improves kitting accuracy, and significantly reduces start-up and shut-down times. This highly flexible kit packaging system provides an integrated solution that reduces costs and increases kit packaging productivity.